Over the past half century, the European Union has grown from a seemingly quixotic set of proposals into a powerful superstate. In an impassioned polemic, Tom Kavanagh argues that the EU is fundamentally undemocratic, anti-grassroots and serves the elites at the expense of the people. In other words, everything the Left should be against. Something Noam Chomsky said in his recent interview with Hicham Yezza struck me, and as the matter has been on my mind for some time I thought it would be a good time to raise some issues relating to one of the points made. The comments in question refer to the evolution of the European Union, and the gradual evaporation of the sovereignty of individual countries which this has brought about. Speaking to Ceasefire about the concept of national governments, Professor Chomsky observed that, in general, states have a propensity “to be violent to the extent to which they have power”, and referred to the consensus (note: among the continent’s ruling classes, not its citizens, although Chomsky does not make this distinction clear) in Europe at the end of the Second World War which dictated that measures should be taken to prevent future conflicts by reducing the amount of relative power which any individual state could accrue. This is a commonly espoused argument: it holds that the European Union is a necessary barrier, acting as a safeguard against the re-emergence of an aggressive dictator or regime on the continent. The EU, it is often stated, has increased cooperation and mutual understanding between European nations and encouraged countries to seek international consensus in place of acting unilaterally. On the surface that all sounds fine, but this fuzzy, progressive, talking shop impression that many have of the institution masks some rather uncomfortable truths. In reality the European Union is about far more than just sharing ideas and learning to tolerate and better understand your neighbours. By and large people in Britain are shielded from any profound, open discussion about the status of the EU and their own national government’s status in it by a paradigm rigidly enforced by official media channels which seeks to place people in one of two camps. You can select either the role of forward-thinking progressive; outward looking and open to “change” and new ideas, in which case you are inherently in favour of greater “integration” with the other members of the Union and your natural place is in the “Europhile” camp. Alternatively, you can choose the path of isolationism, of anachronistic, blinkered jingoism washed down with tepid beer, imperial units and Morris dancing on the village green on a Sunday afternoon. In this case, you select for yourself the “Eurosceptic” label, and by association you are also probably of the same xenophobic ilk as the hordes of bare-chested, red-faced football hooligans whose only first-hand experience of Brussels was drunkenly slurring Rule Britannia and throwing a few plastic chairs at any foreigner in sight during the 2000 European Championships. And that’s it. You’re either for political and economic “integration” with other European states, or you’ve got something against Europeans. You’re either in favour of the European Union, or you’re a backward racist who doesn’t appreciate that we live in a different world now and things have moved on: Get with the times! They are nice-sounding terms, “integration” and “progress”, and as such many people subconsciously disengage their capacity to think critically when these buzzwords consistently crop up in the same context. Integration in the context of the European Union, however, is a concept which is more menacing than it appears to the casual observer. By “integrating” further and further with the gargantuan European Union structure, the British government has lost far more of its independence than is generally accepted or actively mentioned by the broadsheet press. It is easy to see why many on the political “left” aren’t too concerned with this: after all, if the government, so utterly beholden to the interests of private corporations and capital as it is, doesn’t represent us anyway, why should we care if it has any power or not? The answer, often overlooked, is that the alternative is even worse. The European Union is fundamentally and necessarily undemocratic. I am of the belief that much the same can be said of the British political system, however the idea that the answer to the problem of under-representation (at best) at national level is the imposition of a supranational structure that does not answer to the people in any of its constituent countries is an absurdity that has eased itself unchallenged into a position of respectability. The European Union is fundamentally undemocratic because, at its inception, the people in the countries whose governments opted in were not given a say in the matter. The same can be said of countries which have subsequently joined without first polling their citizens – the Union has been imposed from the top down. Since most nations have joined, the powers wielded by the EU have also been drastically expanded, to such an extent that the comparatively benign, trade-facilitating economic union which existed when Britain joined has now been superseded by a virtual United States of Europe, paying lip service to political representation whilst actively discouraging and blocking it. That the institution is necessarily undemocratic is evidenced by the fact that, broadly speaking, whenever a European population has been able to vote for or against binding its own political institutions with those in Brussels, forced integration has been roundly rejected. As such, it is necessary for the people running the show to prevent people from voicing their opinions at the ballot box – if they were heeded, the outcome would be the dissolution of the edifice as it currently exists. The British people were promised a referendum on the EU constitution by the previous Labour government, however as it became obvious that the chances of that being approved were minute following crushing defeats in France and Holland, the ruling classes put their heads together, changed the name, moved a few words around, and rebranded it as the Lisbon Treaty. That’s all right then, no point in wasting people’s time by letting them vote on something that isn’t even a constitution. Former French President Valéry Giscard d’Estaing confirmed what many opponents of the constitution and treaty had long attempted to point out. He told an audience at the London School of Economics that the French electorate’s rejection of the EU Constitution in the summer of 2005 had been a “mistake” which “should be corrected”. Commenting on how he and his kin planned to attain this correction, Giscard d’Estaing affirmed, “Public opinion will be led to adopt, without knowing it, the proposals we dare not present to them directly… This approach of ‘divide and ratify’ is clearly unacceptable. Perhaps it is a good exercise in presentation. But it would confirm to European citizens the notion that European construction is a procedure organised behind their backs by lawyers and diplomats.” That is precisely what transpired. Speaking of the Lisbon Treaty which rose from the ashes of the failed EU constitution, the former Président said “This text is, in fact, a rerun of a great part of the substance of the constitutional treaty”. The French were not afforded the right to vote on the rebranded treaty which differed from the forebear they had roundly rejected in purely cosmetic terms, and it came into effect in late 2009. One of the most effective ways of ushering the EU in through the back door has been for the institution to impose legislation which contradicts the national government’s policy yet has a decent amount of support among its electorate. People are impressed when the European Court of Human Rights overrules judgments by domestic British courts if the final outcome is to their liking, but the more pressing matter is who determined that our national courts should be beholden and subservient to the rulings of a body which does not answer to the British people in the first place? Again, if you are someone who recognises that the phrase “British justice” takes some beating when it comes to brazen oxymora, you probably don’t lose too much sleep when domestic rulings are overturned at European level. However, the fact that a totally unrepresentative and unelected foreign legal system has been foisted down the throats of the people of this country (and we’re not the only ones) by a centralised bureaucracy of appointees who do not have to answer to anybody, means that even those who don’t cling to a myopic belief in the virtue of our courts should be concerned at the very least. The recent furore surrounding convicts’ right to vote has, by and large, missed the point entirely. Instead of the debate over the rights and wrongs of allowing people in prison to cast a ballot, the crucial argument is whether or not we should permit an institution which has been forced on us from above to determine how our domestic government legislates. The truth of the matter is that we do not permit it or, otherwise, the powerful, centralised bureaucracy just goes ahead and does it and we have no recourse to act short of fundamentally changing our level of participation at European level – something successive governments, both Conservative and Labour, have proven themselves steadfastly opposed to. Again, a common phenomenon is obviously at work here. Many people in Britain think that prisoners should be allowed to vote, and therefore they are in favour of the EU forcing Westminster’s hand. It is precisely this attitude which has facilitated the institution’s startling yet shadowy rise to prominence: a belief in the minds of good people that the European Union stands up for them and prevents national governments from riding roughshod over the rights of the marginalised within their own countries. This is a fallacy. The European Union does not function from the grassroots up, in fact quite the opposite. Legislation and protocol is imposed on national governments by unelected institutions comprised of appointed members of the political ruling class from a cross-section of member states. In this sense, the European Union is more closely modelled on the Soviet Union than on the archetypal model of a democratic government (however desirable or otherwise the standard “democratic” model is). People on the “left”, both in Britain and overseas, have been hoodwinked into supporting the imposition of the EU on the political landscape of the continent, assuaged by certain aspects of European policy which people see as desirable. The Union enshrines and protects the status of minority languages in countries where their suppression had hitherto been encouraged by national governments. The EU sets employment standards which many consider preferable to the regulations which their own governments had adopted. Because people see these changes as advantageous and of personal benefit to themselves or the political cause they advocate, there has been a tendency to ignore the process by which they have been implemented. When one begins to scrutinise that process, it becomes crystal clear. These niceties are the bait on a very sharp fishing hook: we are sacrificing our national sovereignty on the altar of “progress” and “integration” without having read the fine print. The temptation to dismiss opposition to the European Union as rooted in small-minded xenophobia is actively encouraged by the corporate and mainstream media outlets most rely on to get their daily fix of news and views. There is an agenda at work which is poorly understood (if understood at all), and too many people associate resistance to Westminster and Whitehall with support for the European Union. They are wrong. As a growing percentage of our domestic laws are made not in London but in Brussels, it becomes clear that resisting the antidemocratic, top-down imposition of the European Union is central to resisting the whims of an increasingly impotent national government. The two struggles are one and the same. The Left cannot allow itself to be swept up in the dragnet. Tom Kavanagh is a writer and activist based in the UK. I can see the point, given the involvement of autonomists in anti-EU summit protests and the like over time… the issue is framed rather differently on the continent from in the UK, with the EU viewed by radicals as akin to the WTO, G8 etc – a kind of elite club imposing neoliberalism. This said… There’s lots of undemocratic and un-progressive aspects of the British political setup, as you admit. Why is it worse for these processes to be happening at a trans-European level rather than a British level? I wonder if you’re assuming some kind of connection between ‘democracy’ and nationalism? The European Court of Human Rights isn’t even part of the EU, it’s existed since the 40s and it’s enforcing standards Britain has agreed to by treaty… it hasn’t been foisted on Britain by the EU. I don’t see how it can be less democratic than the British court system. It’s not like British judges are elected and accountable. They, too, are foisted on us from above. If anything, ECHR is fairer because it’s further away, less caught-up in tides of localised prejudice. It would be great to get rid of all elites, or at least all unelected elites, but I don’t see how European elites are worse than British elites… what do you think I’m missing here? You make a common mistake of buying into the notion that the EU is undemocratic. The EU is in fact far more democratic than most of the national governments. The system has two democratically elected and one democratically appointed pillar: The EU parliament (entirely elected), the EU Council (entirely elected) and the Commission (appointed by the elected officials). Without the agreement of both of the elected pillars, the appointed pillar cannot act. There is a fine balance here between the power of states in the EU and the power of individuals that ensures that the national communities do not feel isolated, while at the same time individuals are given a say in the rule. Much like the US system of Congress with the House of Representatives and the Senate acting as the balance between the states and individuals. As for your argument that the EU is imposed on people from top down, I feel that every government is fundamentally imposed from top down. If you are an anarchist it is clear why you would want to get rid of it, but know that by getting rid of the EU you will not get rid of the top down imposition. Why is it any better? The point I make in the article is that the fact that the British system in isolation is far from perfect is no justification whatsoever for imposing an unaccountable, supranational edifice on top of it, totally removed from and unbeholden to the wishes of people in this country. I don’t see the point with regards to democracy and nationalism, I am in favour of stronger localism and I see the advance of the EU as the polar opposite of that objective. I don’t think so. They are both imposed from above and unaccountable, expressing a preference one way or the other is a bit like choosing the executioner’s blade. That the ECHR is far removed from British politics is not an asset in my opinion, it is evidence that the institution shouldn’t have jurisdiction in this country. We shouldn’t be striving for a system which is “no worse” than the status quo, that is what I am trying to say. In what sense is it preferable to have a conglomerate of unelected, unaccountable people running our political system just because they’re in Brussels and not the representatives of the British crown in Westminster? I don’t consider either option acceptable, and the point I am trying to make is that the EU wins a lot of people on the left over by default, purely because, on the surface, it doesn’t represent the corrupt British establishment. We need to move beyond this dichotomy. The Commission, which is the non-elected branch, is the only strand of the triumverate permitted to propose policy, giving it clear precedence over the other two branches. Elected MEPs do not have this luxury – they are confiend to either approving or rejecting legislation put on the table in front of them. If you contend that it is “democratically appointed”, then an identical argument would hold that British participation in the Iraq war was democratic because it was the result of decisions made by elected officials. The deliberate process of alienating constituents from political decisions has led to a state of affairs whereby most people know extremely little about the institution and recognise that they have no say in decisions passed at European level. The EU political structure bears no resemblance whatsoever to a genuine, participatory democracy. Quite. I have little time for people who want rid of the EU but are perfectly content living as subjects of the Crown in Little England. The point I am trying to convey is that the choice is not between one or the other, and that the EU, from its birth to the present, has been imposed on the people of this country rather than offered to them and accepted. Giscard D’Estaing said as much after the Lisbon Treaty was agreed – that if Britain was given a referendum, it would not pass. Irrespective of your opinion with regards to the merits or otherwise of British membership, it is surely not desirable to deny people the right to vote one way or the other. The major British political parties offer no choice whatsoever on the matter. Cameron makes headlines by not flying the EU flag but it is empty rhetoric – among the political establishment in Britain there is no genuine debate and no genuine choice. Yes, the Commission is the only branch that can propose legislation. This is true in theory, but in practice the legislation is often proposed by the parliamentarians who go to the commission to propose something. What is most important is that the legislation cannot pass without the approval of the parliament and that the commission cannot be appointed without the approval of the parliament. In effect the EU’s power to legislate is only weakened by the fact that only the Commission can propose legislation. The legislation will not go through if the democratically elected pillars do not agree (and they often do not, proposing amendments). As for the referendum: I think the British should be able to decide whether to be in the EU or not. Having said that, the Lisbon treaty is a fairly complicated piece of legislation that I do not believe should be put to a referendum. Referenda are usually quite terrible for political reform as most of the people who are “don’t know” before the referendum opt to vote “no” – they view this as the default position. This has been shown to be true in many referenda around the world. Therefore the uninformed who know they are uninformed go to the referendum and ruin the chances of good reform passing just because they are not sufficiently informed. I don’t think this is a good way to reform a political system, be it a Lisbon treaty, transitioning to a republic or a reform of the voting system. The parliament, democratically elected and far better informed than most people, decided to accept the Lisbon Treaty. Not to mention that the Lisbon Treaty makes the EU considerably more democratic and streamlined, a demand long vocalised by the opponents of the European integration. 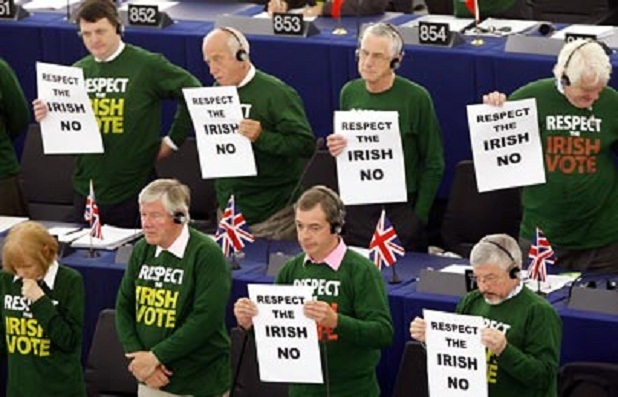 That they then go on to oppose the Lisbon treaty and demand a referendum (which as you say would likely have resulted in a no) is utterly hypocritical. “Not to mention that the Lisbon Treaty makes the EU considerably more democratic”. I disagree, and even if it were true, that wouldn’t be saying much. You say the British parliament is “democratically elected and far better informed than most people”, I say it is beholden to vested interests and acts on behalf of these rather than in the interest of its constituents. The argument you present is similar to the old Soviet argument that the people don’t know what is good for them and need to have qualified experts telling them what to do and making decisions on their behalf. I don’t dispute that people are often uninformed, often disinterested and often incapable of objective, rational analysis, but the solution you endorse is the antithesis of a participatory, inclusive, representative system. In fact, it’s precisely because people are so used to being dog trained and told what’s good for them that the EU has been allowed to balloon in terms of size and potency to its current position. The EU system is too far removed from people in this country and the constituents in other member states. This process of centralisation and uniformity is spreading and it needs to be checked. Whether you agree with the status quo or not (and I don’t), “no” is incontestably the default position. You’re right that opponents of the EU have criticised it for not being “democratic and streamlined” enough, but they’ve also criticised it because it has been forced through without consent at every stage. The Lisbon Treaty is true to form on that score, and from your comments, it appears that you support that method. About time we had a proper discussion started on the left regarding the essentially anti-democratic nature of the EU. Never forget there were good reasons why the Labour Party were historically the opponents of the EEC and its successors and that the Tories were the main proponents of it. This debate should go beyond party boundaries and become part of the national discussion on how we should be governed alongside the question of localism and the future of the upper chamber. In our so-called “representative” democracy parliaments are democratically elected, that much is true. There is more representation of the electorate with a proportional system, less with first-past-the-post. There are two problems here: For one, electoral participation has slumped around Europe, indicating that a substantial number of people do not expect parliament to adher to their needs. Secondly, elected members of parliaments are on the whole more likely to cater for business and establishment needs (there are important exceptions, but I’ll come to that later), once again fueling abstention. Most definitely this also applies to the European parliament. In fact, the remoteness and seclusion of Brussels facilitates a split between the electorate and their representatives. There are thousands of lobbyists crowding EU corridors – a member of the European Trade Union Federation told me their impact on EU policies reflects them being one of this multitude. One of the key words besides “integration” and “progress” is “harmonization”. This is one of the goals of EU policies: to harmonize regulations in the member states. In reality this leads to the worst-case scenarios being implemented – see the policies on refugees and workers’ rights (reinforced by European High Court rulings). And yet the EU and its machinery leaves scope for necessary action. Individual MEPs, especially those from the Left, use their powers and status to bring on necessary debates. The EU parliament was venue for a European hearing about conscientious objection, and anti-discrimination regulations made a proper debate about the plight of the gypsy peoples possible, leading to measures aiding and censuring Eastern European countries and to the condemnation of Italian and French domestic policies. The framework of the EU institutions makes it possivle for trade unionists and workers’ representatives from all over Europe to get together, i.e. through the European Workers’ Councils, and to begin necessary agitation in Eastern Europe where free market policies left hardly any scope for work relations. And who are we to say that a little bit of state welfare is worse than none at all, as was the case in Jersey (Channel Islands), my birthplace. It implements foreign, military and economic policies in line with an imperialist agenda. It redirects human rights to the side-line. It reduces workers’ relations and trade union powers to an extand that Maggie wouldn’t have dreamed of. But there it is. And we have to cope with it, whether we want to or not. We don’t, of course, but the Left is still fighting defensive battles, not determining the agenda. And what the EU offers us defensively, we should use.